The month was slipping away. 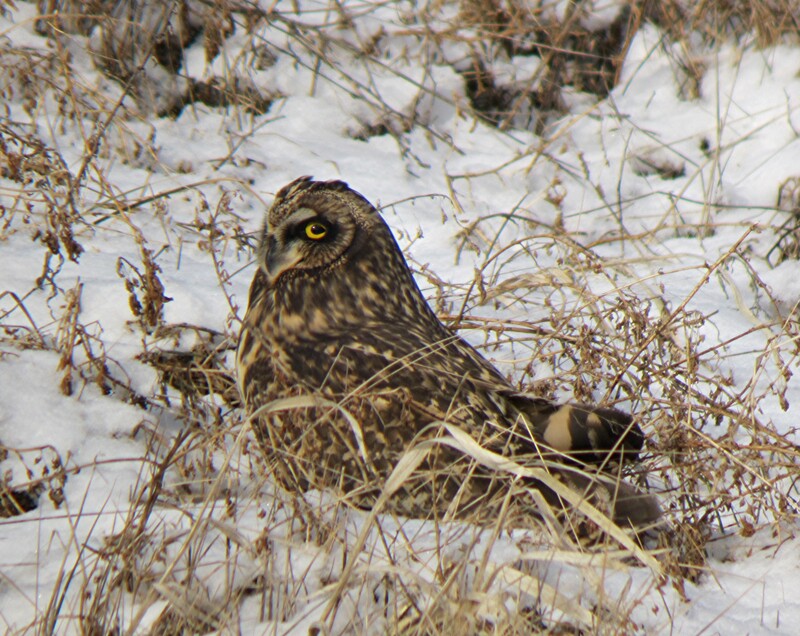 This was the last full weekend before February and with 2 solid days where I could go birding. 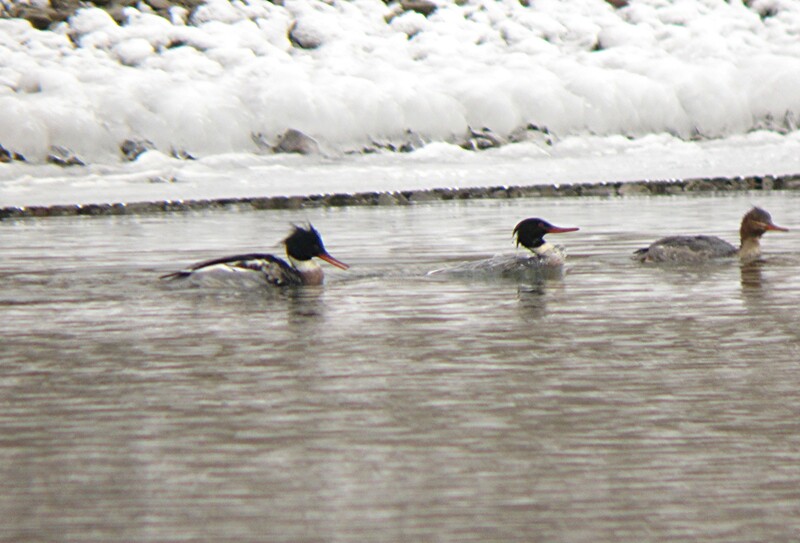 And it was supposed to snow on Saturday, which made finding my final bird for the month just that more important. However this was the last thing on my mind as I made my way to Oxford Ohio to visit my oldest son for the evening. 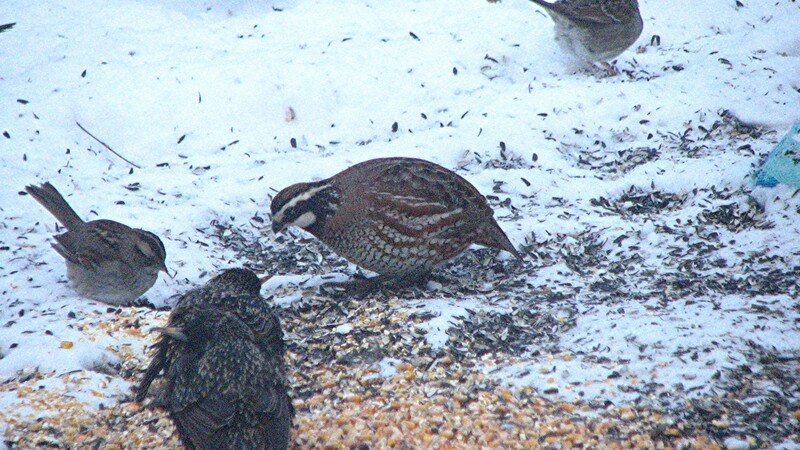 Then I received the phone call…it was my best friend Phil…a male and female Northern Bobwhite were under his stationary feeders eating the seeds on the ground. And here I am an hour away with hardly any daylight left. So I told him the situation and asked that he keep me informed as to whether they return the next day. 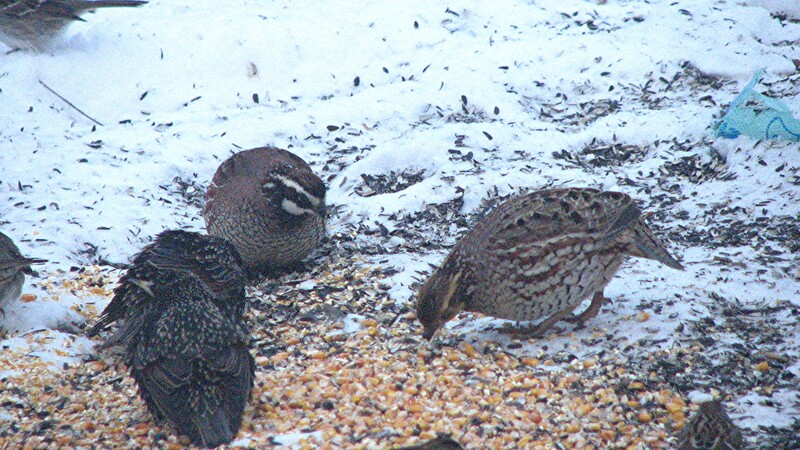 Northern Bobwhites were once a very abundant species, however with the loss of habitat they’ve now become fewer in numbers till you could almost call them an uncommon species. So when the call came yesterday while still at work that they just showed up again to feed lifted my hopes. 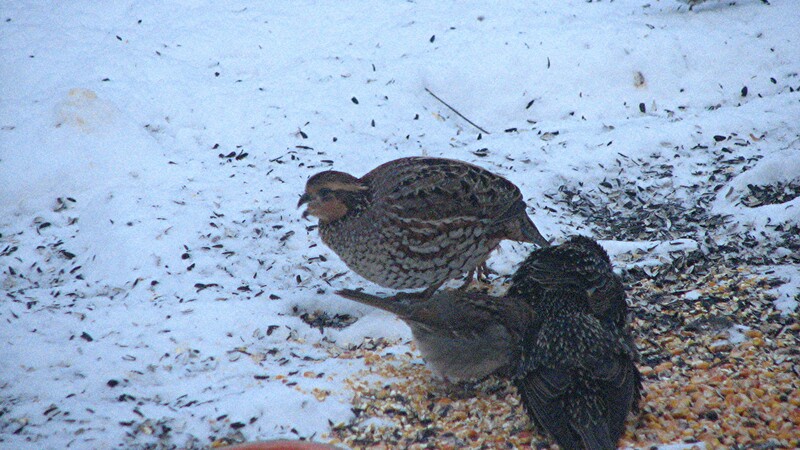 Even though Phil’s house fronts a very busy road, the back and sides offer the cover that Bobwhites like, and they used that cover to sneak in and out to feed throughout the day. From what Phil was observing they would stay for about 15 minutes, feed, then leave. I smell a pattern that I might be able to use to catch these birds with my bins. So after work yesterday I made my way over to his house to play the waiting game. As the clock approached 5:30 they came out. 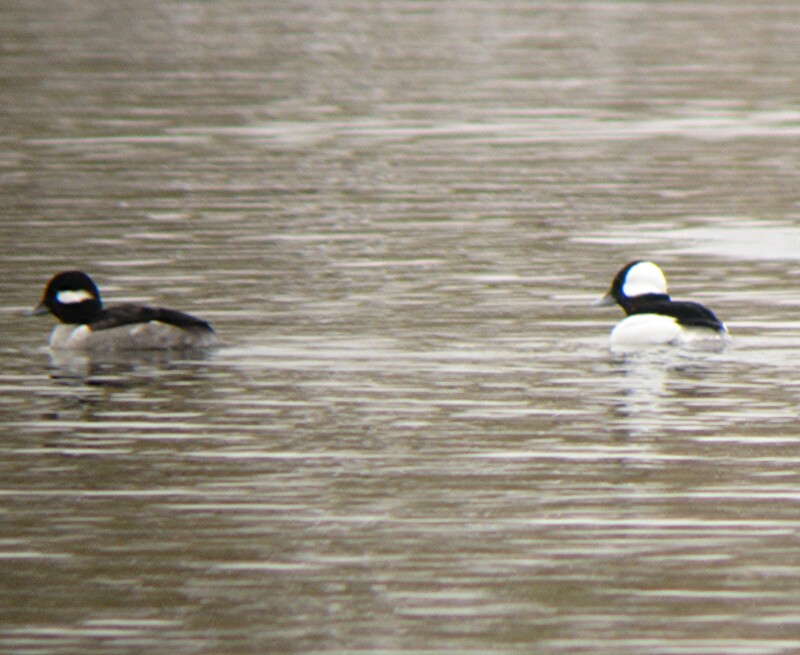 1 male and 1 female, and 100 species. Sorry for the poor quality photo. You see I was taking this picture through 2 doors. One with just a glass pane and the other through a screen. So here’s the list of birds for this January 2014. So until next year I’ll just keep on birding. A few days ago I wasn’t giving myself much of a chance of seeing my 100 species for January. Being the eternal pessimist there’s always that place in the back of ones mind that keeps repeating over and over again that, “it’s a lost cause”. The month is slipping away fast and being back at work from my extended vacation only allows me the weekends to get my birding in. And since this will be the last 3 day weekend due to it being a holiday, I thought I’d better make the best of it. Yesterday I had 2 target birds in mind as I started the day a little later than I’m used to. A helpful tip from Brian Wulker put me right in the middle of Clifton, specifically Burnett Woods, for a very difficult bird to locate. The Winter Wren. At 4″ in length, this nervous little birds loves to hide in the tangled roots and under growth of the woods. So the technique that I’ve got to implement today is to try and “pish” them out into the open for a quick ID before they scurry back into the under growth. One of several entrances into Burnett Woods. This one is the Ludlow Avenue entrance, with the nature center off to your right and the small pond directly ahead. My son David worked her for the parks last Summer and was familiar with the layout of the park and specifically the area in question where Brian saw his Winter Wren. There is a marshy area opposite to where I was coming in from, and that’s where I was heading. There’s a trail that circles the pond so i started on the left side of the pond where the under growth in thicker with Honey Suckle and brush piles, which Winter Wrens love. For 45 minutes or so I made my way around the lake stopping and vocalizing trying to entice a wren to pop it’s head out. It wasn’t until I started to make my way back when I caught a brief glimpse of one flying low to the ground and returning to the base of this tree with a patch of green leaves growing around it’s base. I focused my attention on this spot and started to “pish”. Wren’s find it difficult to resist someone “pishing”, and out it popped. It gave me some great views and a good start to the day. Now onto my next target bird, Rough-legged Hawk. 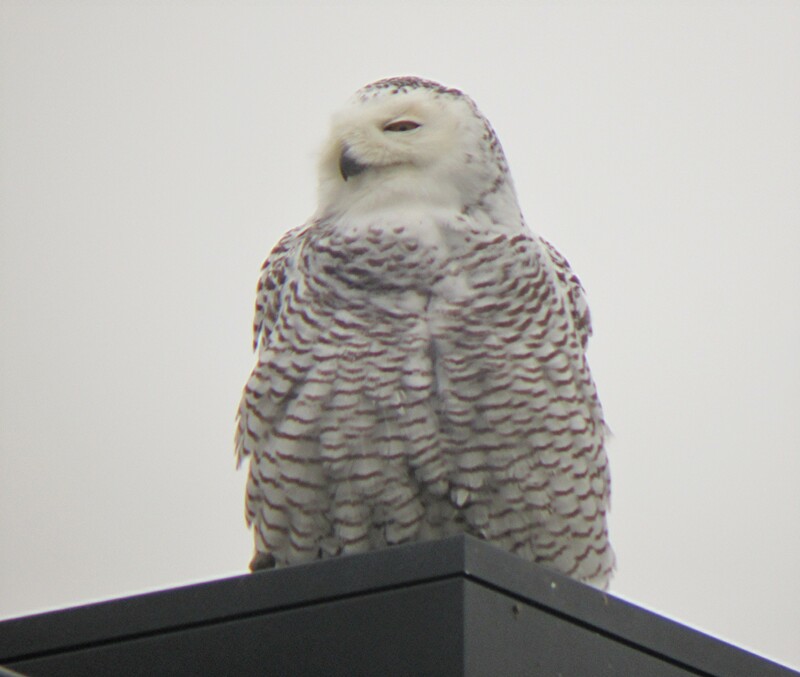 Now this winter one of the more dependable areas to see Rough-legged Hawks was at the intersection of Whitson and Loomis, which borders CVG (Great Cincinnati, Northern Kentucky International Airport). Not being familiar with this part of the airport I studied a map of the area before setting out. Confident on the location I made my way down the highway to the area in question. As I’m driving the sun comes out, and so does my hope for finding this bird. For some reason big raptors like the sun, and with the warmth of the earth I’m sure it also helps with their lift in flying. As I pull of the road there is a noticeable gravel pull off where the 2 roads meet. Plus there is a service road that extends from the gravel pull-off towards an under-pass towards the airport. So as I pull off the road and stop I immediately notice a large raptor flying and hunting just over the wire fence directly in front of me. Sure enough it my Rough-legged Hawk. This is almost too easy, as I exited my car to get a better look as it started to hover slightly. It wasn’t till I exited my car when I noticed a small group of large birds fly out of this drainage ditch that runs parallel to the service road. 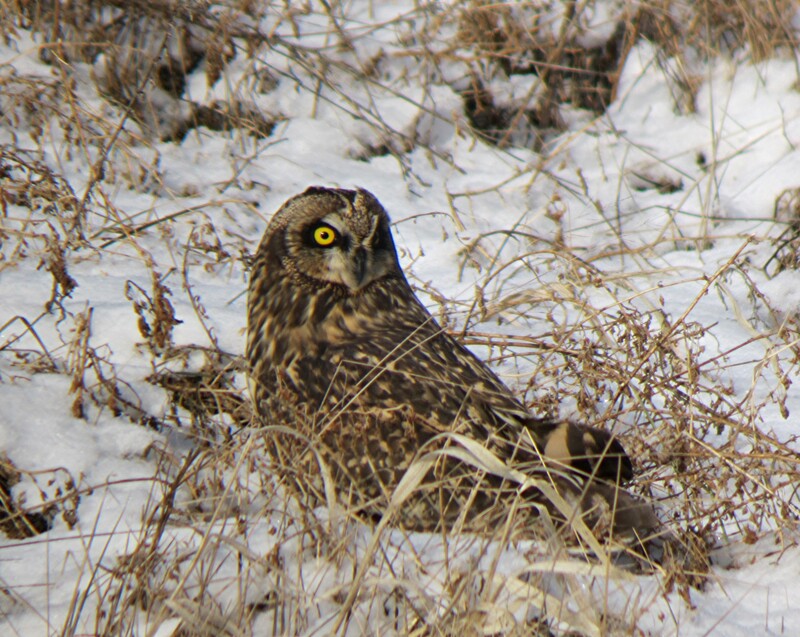 Much to my surprise it was 8 Short-eared Owls. EIGHT! It seems they were feeding on something in the ditch, and as I watched in amazement one came back and set down. Not wanting to have a photographic opportunity like this pass me by, I positioned my car at an angle from the owl so I could get out without spooking it by hiding behind the door, and also get to the back hatch so I can get my scope and camera out. 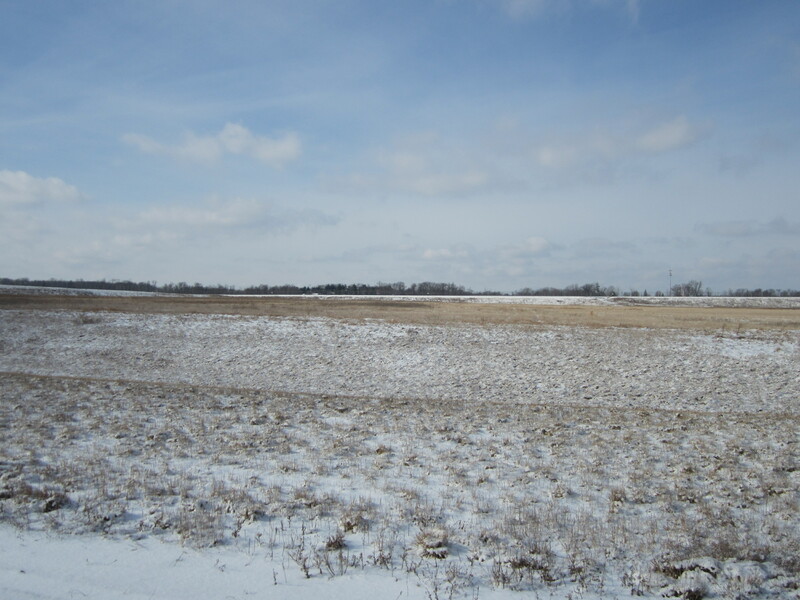 This is the large field that the remaining 7 Short-eared Owls circled around after I accidentally spooked them. Now my total for January stands at 98. Now I’m feeling a little more positive on making 100 species. So where to next? Armleder Park and try once again to get the great Horned Owl that always hangs out there. As I start to pull away the CVG Police pull up wondering what I’m doing here, especially taking pictures. She was a real nice lady, and after explaining to her what I was doing and after showing her the pictures I took. And to add some credibility to my story I pointed out all the owls that were circling the field just behind her. Even though the gravel pull off wasn’t posted, I guess I was just too close for them, and she reminded me that I shouldn’t bird here in the future. Passing the muster that I wasn’t a bomb-totin’ terrorist I made my way back over the river to the sanctuary of Ohio, and Armleder Park. After I parked my car it was a short 10 minute walk back to the woods where the GHOW likes to roost. But not today. So I’m still hangin’ at 98 birds when I large flock of ducks fly over head. 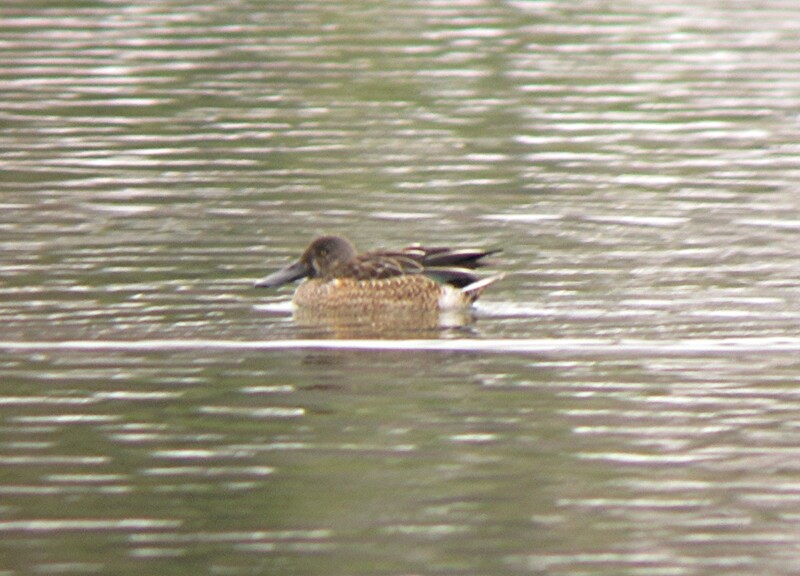 I was standing at the edge of the woods near the bean field as I scanned up and saw my next bird that would bring my count to 99 birds, a Northern Pintail. So now my focus is on just 1 bird. And it’s a Great Horned Owl. So after leaving Armleder Park, I head up the Little Miami valley to check out areas where they might be found, plus some of the gravel quarries and lakes to see how much ice has formed over the past few days. One of my stops was Camp Dennison Nature Trail where I did spook an owl, but I never got a good look at it to determine if it was a Great Horned, or Barred. At lake Isabella the nesting can was still empty, where in years past this was a slam dunk for nesting Great Horned Owls. So I made it home with needing only 1 more bird for January and tomorrow to get it. 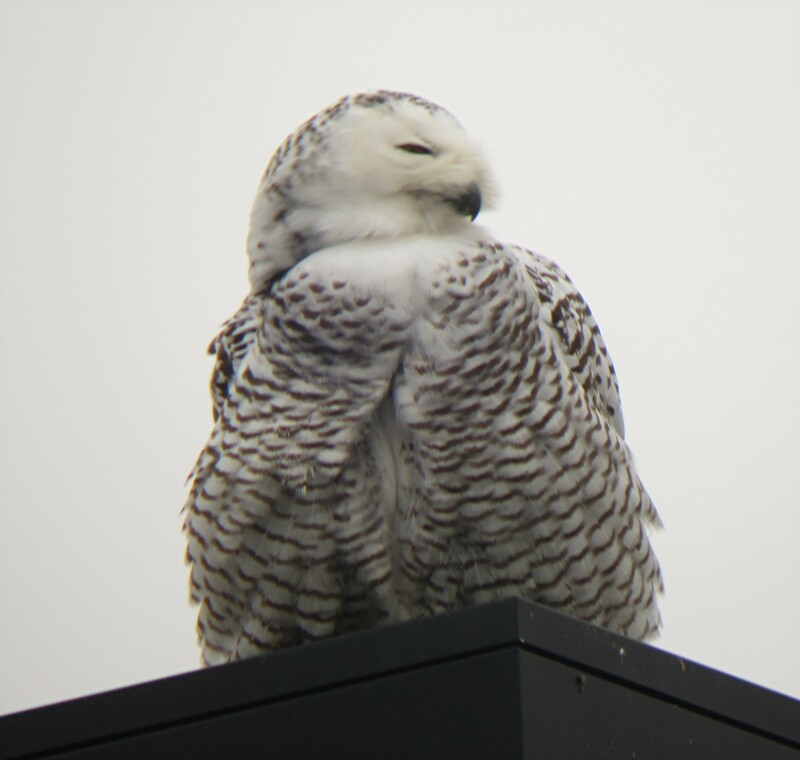 So my plan is to get up early once again and head towards Fernald and the stand of Evergreens that always houses owls. And if I’m successful, then the rest is just icing. With almost 2 weeks already gone for January the anxiety level of making 100 species is a foreboding cloud over my head. Will I, or won’t I make it? So yesterday John and Jon and myself hit it pretty hard in Western Hamilton County with stops at Fernald Preserve, Miami Whitewater, Whitewater Senior Center, and other various spots along the way. Then to top it off after I got home I find out that a Surf Scoter was seen at the mouth of the Licking River. So I was back into the field again chasing a relatively rare bird. Then this morning I was up to Caesar Creek to try for a couple common birds there. After yesterdays birding adventure to Big Oaks N.W.R. I really didn’t have too many plans for today other than sleep in for once. And I did, and it felt great. As the morning wore on with hardly anything accomplished, the report of a Loggerhead Shrike at Armleder Park was certainly enticing. A Loggerhead Shrike is ubber-rare in these parts, however if I don’t make an attempt to re-locate the bird I’ll just end up kicking myself, especially if someone else finds it before me and I was just too lazy to go. With Kathy away for the rest of the day I grabbed my gear and started to head down the highway. It was during this drive that my friend Phil calls me on my cell phone. 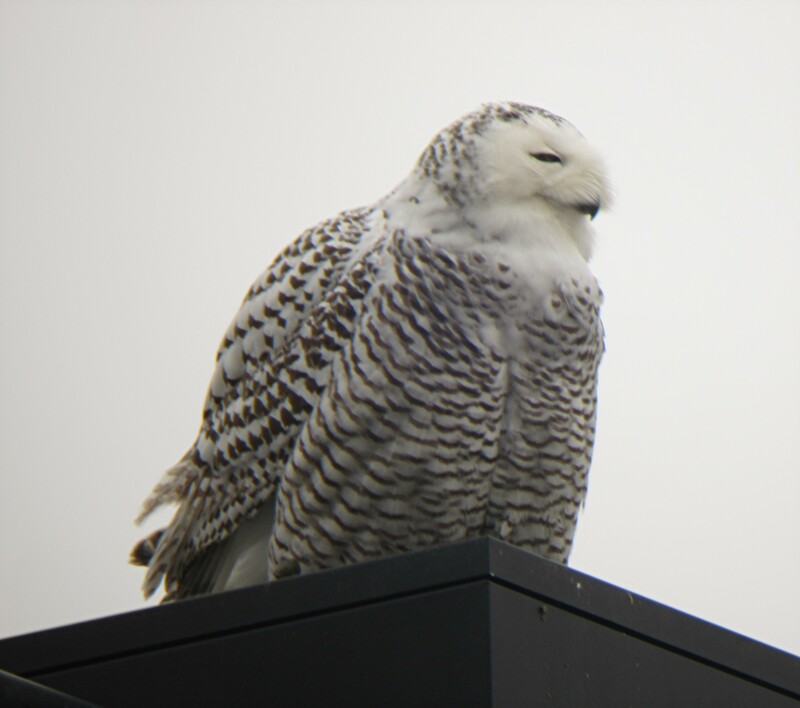 A Snowy Owl was seen at the Home Depot in Washington Courthouse. WASHINGTON COURTHOUSE! That’s like next door…almost. I make it to the next exit and point the bird-mobile north. As I’m doing this I’m calling my son David to lend a hand in the directions. Even though Washington C.H. is just next door, I don’t know exactly where it’s located in town. So for the next hour I’m on again, off again with David has he updates me on the status of the bird and to help me locate the Home Depot. It’s during this time the fog settles in. And it’s thick. So thick I’m even wondering if I can get a clear shot of the bird even if I stand underneath it. But my worries were for naught as I approached the town. The fog wasn’t nearly as thick as when I was on the highway, so as I turned into the parking lot you couldn’t help but notice this white blog sitting on top of the light pole. What an absolutely awesome bird. And if that wasn’t enough birding to last for awhile, I decided to head back down the highway to Armleder Park to try and find the Loggerhead Shrike. I think I’ve gone mental! I spent about an hour scouring the area that it was originally seen without any luck, till I notice a small raptor with pointy wings flying low. There’s my Merlin…as it zips by and into the trees. It really is time to go home now. But first lets stop by Grand valley for one last peek over the edge to see if that White-winged Scoter was still there. And in the fading light amongst the hundreds of other ducks and geese was the White-winged Scoter. It was still there…just for me. Content with today’s finds I finally head home for a much deserved adult beverage. As with so many aspects of life it’s not what you know, it’s who you know. And a great case in point was yesterday when I meet up with a great individual and really good birder, Gary Stegner. 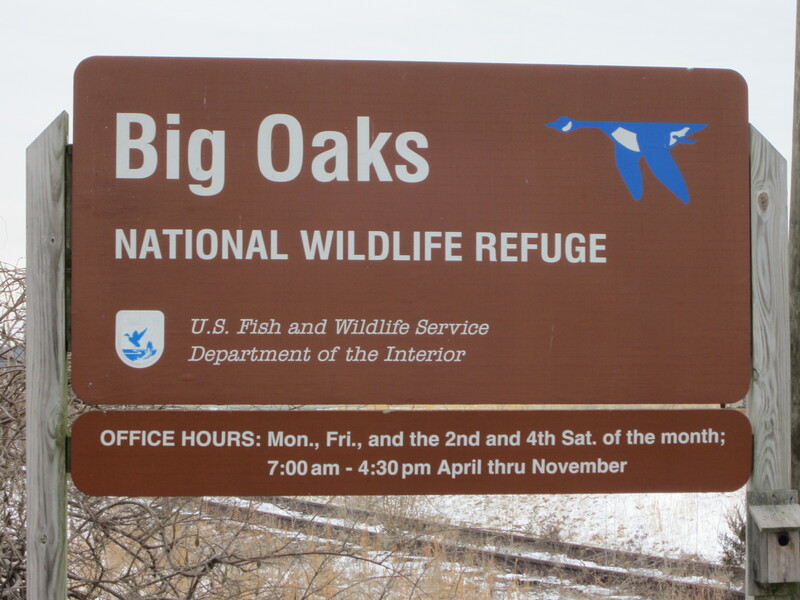 So what does knowing Gary and Big Oak NWR have in common? 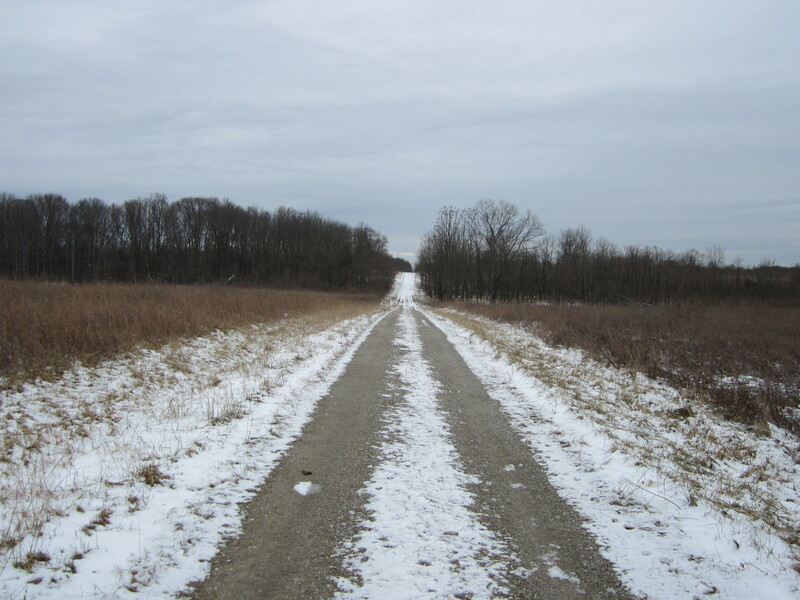 Well Big Oak is closed to the public from December till April, and since Gary worked there when the U.S. Army ran it as the Jefferson Proving Grounds, and now as a volunteer, he has access to the key that opens all the gates throughout the 50,000 acre refuge. Even though the Army still own the property, the U.S. Fish and Wildlife Services manage the property. Needless to say this place is massive. The topography of the refuge is mostly flat open fields with very large woodlots, mature forests, and gently rolling hills. 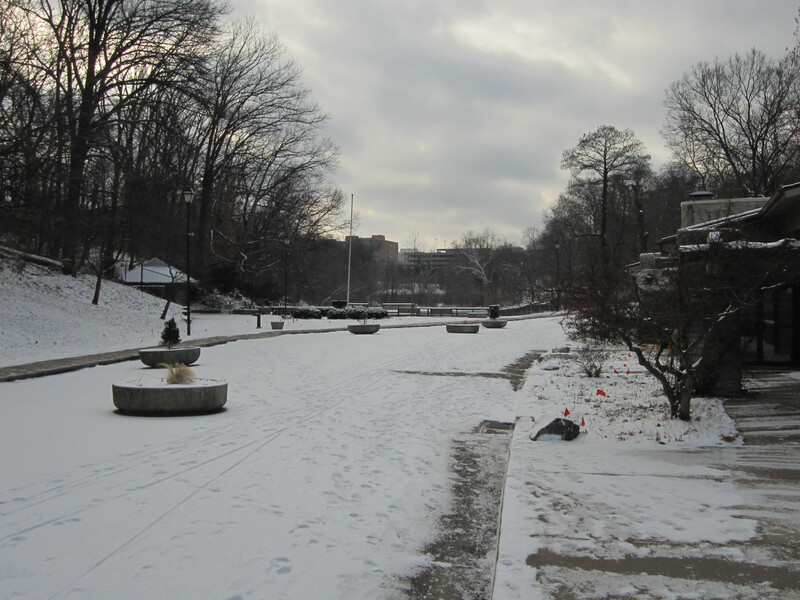 There is one sizable lake which at the time was mostly frozen over. 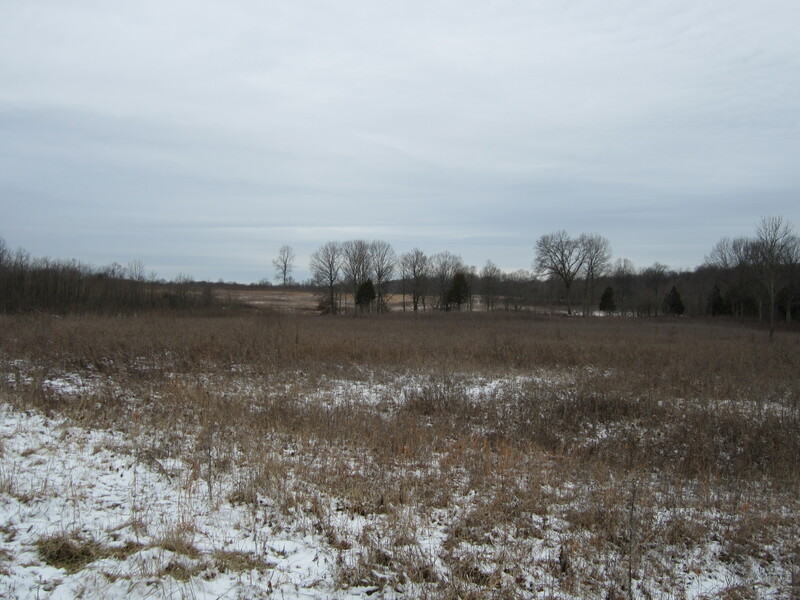 It also contains one of the largest contiguous forest blocks and grassland complexes in Southwest Indiana. And just last year the counted approximately 500 nesting pairs of Henslow Sparrows. However I’m here to try and find one species. A Golden Eagle. According to Gary they had one on their Christmas Count, and even though it’s like trying to find a needle in a hay stack, it’s a really big needle. And there’s no way you can walk this place, so the use of a vehicle in most important. The gravel roads were rough and bumpy so driving through took a long time. Some straight-a-ways were miles in length. They would pass through vast open grasslands, then plunge into a large forest. So the variety of birds can be impressive. They have 120 breeding birds on the refuge, and that’s not counting the ones that pass through. One of the smaller open grasslands that dot the refuge. This is the habitat we spent most of the time looking for our Eagle. We put forth a great effort to find this bird, but dipped in the end. Now I didn’t drive over 2 hours just to focus on one bird, this wasn’t one of my typical bird chase for a rarity type of thing. I also needed to add birds for my January list and my hopes were high. As the hours ticked away we added more and more birds. The sky was gray and overcast all day which could explain why we saw very few raptors. This would be a great place for Rough-legged Hawks, but we never saw one. Red-tailed Hawks were in abundance, as were Northern Flickers. The miles rolled along as we drove throughout the refuge. We both commented how lifeless the refuge was. Birding was tough, and the ones we saw we worked pretty hard trying to get. But as the day ended we had a somewhat respectable day list. I was able to finish off the remaining Woodpeckers for January with Red-headed and Pileated. I also ticked off Black Vultures as we passed the compost heap. After we left the refuge we drove the long way back to get to my car. We did spook up a small flock of Snow Buntings feeding in the corn stubble as we neared Gary’s house. It was a great day and with an open invitation from Gary I will return someday. I can only imagine driving through one of the grasslands and hearing hundreds of Henslow Sparrows singing. However my day wasn’t over. Driving back towards the Interstate I made a point to drive through the Oxbow. The roads were in a rough state and the lakes were all frozen over except for a few spots on Oxbow Lake. 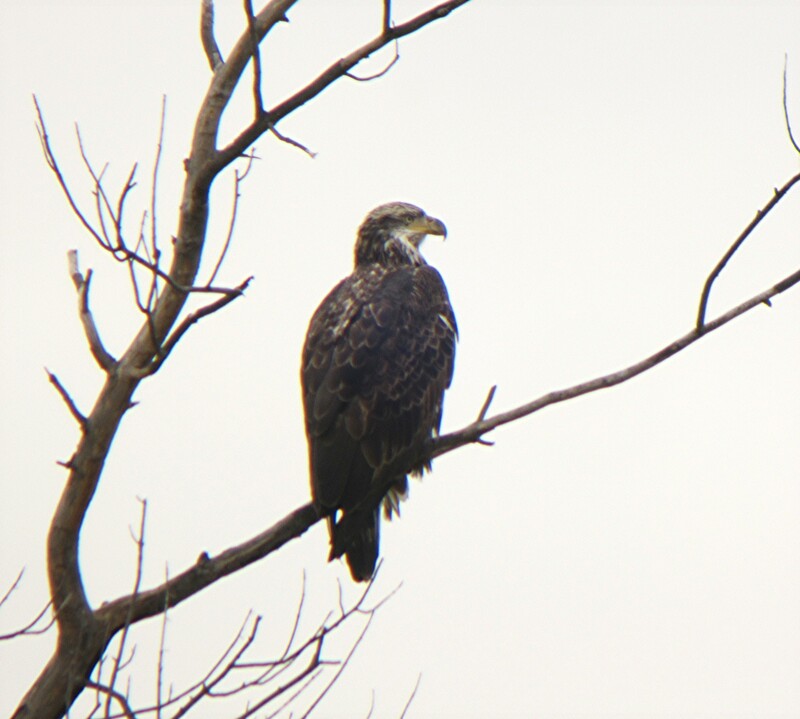 I was able to get pretty close to this sub-adult Bald Eagle. After leaving the Oxbow it was onto Lost Bridge and Hidden Valley Lake. As is the case after a day like this birding. I was bushed! And then to read later that a probable Golden Eagle was spotted feeding on a dead Deer carcass near to where I was. Like finding a needle in a hay stack. My January total is now 84.